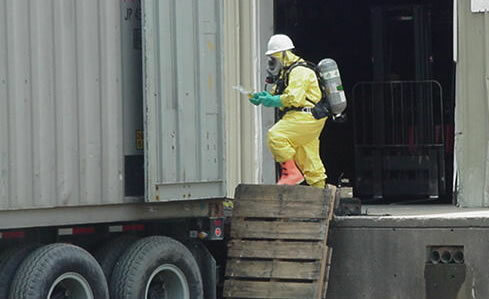 If the substance is either an Extremely Hazardous Substance, as listed by the US Environmental Protection Agency, or if the name or components are unknown, the Regional Response Teams are authorized to begin an immediate response. Other known substances require an approval process through the department secretary. Due to travel time and distances for a responding team, local emergency response agencies must be capable of holding the situation until the Regional Response Team arrives. Clean-up of the material, and restoration of the site is the obligation of the responsible party. The Regional Response Team and/or representatives from the N.C. Division of Water Quality or N.C. Division of Waste Management may provide guidance on how to select a clean-up contractor. If a responsible party has either not been identified, or is unwilling to take responsibility for the clean-up, the local emergency management coordinator, in conjunction with Water Quality and Waste Management representatives may authorize clean-up to begin. Reimbursement for costs associated with the local response and recovery may be submitted to the Environmental Protection Agency under their Local Government Reimbursement program. If necessary, the local coordinator or state environmental or emergency management representative may request assistance from a federal on-scene coordinator from either the EPA or the U.S. Coast Guard.